The Steel Authority of India (SAIL) constructed a dam for the water supply to the Rourkela Steel Plant (RSP) during the early 1950’s. 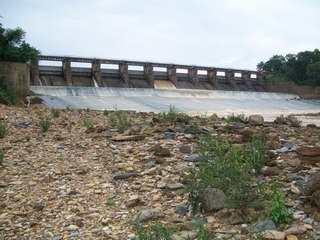 The dam was built on the river Shankha near Rourkela, Orissa. This dam was conceptualized along with the Rourkela Steel Plant. It was a project of bilateral cooperation between India and Germany. German planners, German engineers and workers contributed essentially to the making of RSP and the Steel City. In 1953, the Government of India held consultations with German steel companies. In the 1950s, the public sector corporation Hindustan Steel Limited (HSL) had purchased a complete steel plant from 36 German companies (among them leading German companies like Mannesmann and Krupp) with roughly 3,000 subcontractors, but without sufficient coordination of the numerous supplies. Unfortunately, the HSL was not able to pay in cash as was originally considered. In 1958 German ECA KfW, with the support of the German Federal Government, took over the promissory notes to prolong the Indian obligations to pay. To avoid default on payments, from 1958 onwards, the German Government gave loans to secure these kind of core sector undertakings which was originally started by the private sector. As per Orissa government’s gazette notification, over 33 villages covering 25, 03,524 acres of land had been acquired in 1954 to set up the RSP and the reservoir . The displaced people were not compensated properly. The partially compensated persons to whom the land was given was neither of equal size nor in quality. So, the people are demanding the compensation in terms of jobs and money since the project was implemented. The German organization Adivasi-Kooperation reported that "eviction operations were carried out in a manner which most of the displaced described as very brutal." . People were loaded onto trucks and dropped in the forests without any instruction. Some of them were "forced to migrate further in search of a livelihood or were even evicted a second time by other new projects." . - the urgent demarcation of the already allocated land. Why? Explain briefly. The dam was built and now serves the steel plant. Compensation measures have been only partially met.